If you don't mind giving up some responsiveness, we think the Lexus NX 300h Hybrid is a smart pick—and it's just as comfortable, refined, and luxurious as the 200t in most respects. Striking styling and a turbocharged engine are only the opening acts for a remarkably well-rounded family of 2016 Lexus NX compact luxury crossover models. The 2016 Lexus NX lineup enters its second model year mostly unchanged. This entirely new model brought several firsts to the Lexus lineup with its introduction last year—a first compact crossover entry for the brand, the first model for the brand with a turbocharged engine, and the first utility vehicle to be given a new design language, which has since been followed in the larger 2016 RX lineup. The NX takes on a crowded field that includes the Acura RDX, Audi Q5, BMW X3, Mercedes-Benz GLC, Cadillac SRX, and Volvo XC60, and it relies on the outstanding reputation of the brand—as well as a far more aggressive design—to stand out. Keep in mind that the drama is mostly in the sheet metal; the profile isn't all the impractical, and the interior is just a slightly more styled version of what's familiar from the brand's other products. There are essentially two powertrains in the lineup: a 235-horsepower turbocharged 2.0-liter inline-4 paired with a 6-speed automatic in the NX 200t; and a 194-hp hybrid powertrain in the NX 300h. 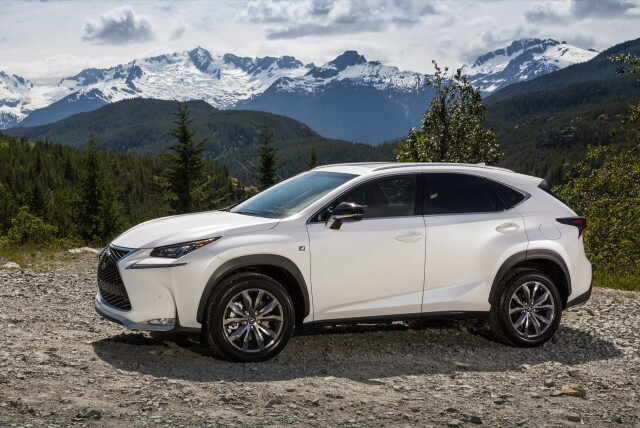 A third variant, the sporty NX 200t F-Sport, gets a more aggressive grille, unique interior trim, comfortable sport seats, and slightly retuned suspension; although its performance isn't all that much different than the base model. 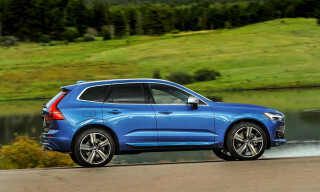 Both models are offered in front- or all-wheel-drive (AWD) versions, though the hybrid sacrifices the 200t's mechanical AWD system that sends engine torque to all four wheels and substitutes a 50-kilowatt (67-hp) electric motor on the rear axle. While the handling and electric power steering are very good, getting sufficient performance out of the standard turbo engine requires aggressive driving. It's tuned for fuel economy, meaning that the combination of turbo lag and the need to shift down a gear—sometimes two—produce delays in full acceleration. The most fun model is the F-Sport when it's set to "Sport" mode. The hybrid is smooth and very quiet, and with a new "kickdown" acceleration mode, feels faster than it actually is. At 183 inches long, the 2016 NX takes up about parking space of a compact sedan. It's sized right in line with compact utility vehicles like the luxury models mentioned above, as well as mainstays like the Honda CR-V and Subaru Forester—and the Toyota RAV4 with which it shares some underpinnings. With sport seats in front, as well as a lower seating position than some crossovers, Lexus stresses that it's far sportier than the larger RX mid-size utility vehicle intended for families. Rear-seat space is decent, though the long, low cargo floor doesn't have much volume above it—a side effect of that fastback shape. The NX is an IIHS Top Safety Pick+ for 2016, and it offers quite a few active-safety features, including all-speed dynamic cruise control and a blind-spot monitor with rear cross-traffic alert. A head-up display is also available, and it comes standard with eight airbags. And a whole suite of electronic safety systems is available, including adaptive cruise control, a frontal-collision system that warns the driver of impending objects ahead and can brake to a stop automatically from 37 mph or less, a lane-departure warning system, and smart headlights that dim automatically for oncoming vehicles. The 2016 NX is the first Lexus to offer wireless charging for mobile phones, and it marks the debut of a new generation of the Lexus Remote Touch interface—this one featuring a touchpad, haptic feedback, and pad-like capabilities that let you trace letters directly on a surface—similar to those you may have seen on some Audi or Mercedes-Benz models. The 2016 Lexus NX 200t comes standard with heated side mirrors, LED illumination for the door handles, a smart key, and 17-inch 10-spoke aluminum alloy wheels. Inside, the power adjustable driver's seat adjusts 10 ways, and the front passenger seat in eight. The 60/40 split rear seat reclines and folds down, and includes a center arm rest with cup holders. LED taillights, front running lights and LED low beams are included. Available options include a power folding 60/40-split rear seat, which also reclines—a Lexus first—and a power liftgate. The standard audio system features HD radio, Bluetooth pairing, free traffic and weather data, and a caching feature that lets listeners temporarily pause and store a song or news broadcast for up to 15 minutes. The optional premium audio system combines digital signal processing for better high notes with an eight-channel amplifier, playing through eight speakers. And new for 2016 is Lexus Enform Connect connectivity, allowing owners to use a mobile app or website for maintenance alerts, a vehicle health report, and more. 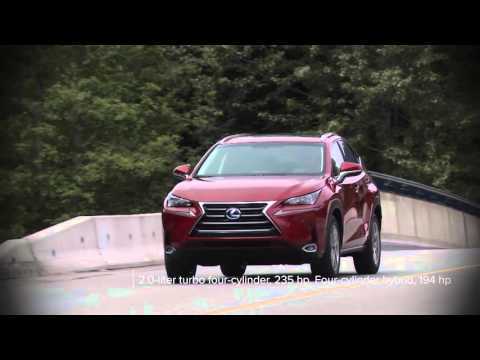 The NX 200t manages 22 mpg city, 28 highway, 25 combined in rear drive, 22/27/25 mpg in all-wheel drive. The NX 300h earns 35/31/33 mpg, according to the EPA. The exterior look of the 2016 Lexus NX is aggressive and not for everyone, but the interior is a little less radical. Prior to the introduction of the NX, last year, Lexus didn't have much of a reputation for daring in its designs; but the NX has reversed that trend—and it's even been joined for 2016 by a very bold new design for the larger Lexus RX family. The NX sheet metal is visually engaging at best, although it can feel a bit busy from some angles on the outside. It blends sharp creases, pointed shapes, and an almost fastback shape to make a crossover utility vehicle that's unlike anything else on the market. While the production vehicle has been toned down from earlier concept cars—which looked like angry vacuum cleaners that might eat your children—its exterior is still a large step toward the polarizing by Lexus. A sharp crease angles up from the base of the front wheel well through the rear wheel to the line of the thin taillight, with a deep indentation in the door forming an asymmetrical sill in the base of the door. The front leads off with an in-your-face versions of the Lexus spindle grille shape, with a softly rising hoodline above it, flanked by narrow, swept-back headlights with an L-shaped band of LED daytime running lights outlining it. The NX 200t F-Sport is likely the model that will appear in much of the advertising for the vehicle. Its black mesh grille is significantly bolder than the chrome slats of the standard NX, and it also comes with metallic bumper moldings, black side mirrors, and two choices of 18-inch wheels. The optional 20-inch wheels give the compact Lexus crossover its most aggressive stance, and may offer the most visually appealing combination. Overall, if you can look past all those details, the NX profile itself isn't all that shocking. 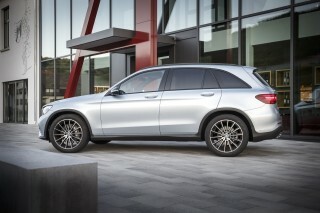 It retains the basic two-box form of the crossover utility vehicle, though its sharply angled tailgate makes it far less rectilinear than the Audi, BMW, and Mercedes. There are a lot of sophisticated shapes in its lines, with lots of slashing angles and sharp points in the body creases, lights, and window lines. The interior of the NX is somewhat more restrained than its exterior. Colors and materials are in the usual Lexus palette of dark grays, muted silvers, and matte wood grains, and that helps it steer away from the garishness offered in some rival models if you don't watch out. The metallic accents contrast nicely with the softer trim and upholstery materials, complementing the large round gauges. Still, the long and angled dash top and protruding console form an unusual Z-shape when looked at from the side. In keeping with its sportier positioning, the dashboard conveys more of a cockpit feel. The front compartment, in fact, has more in common with the Lexus IS sport sedan than the mid-size RX family crossover. Autumn Shimmer and Blue Vortex Metallic are new colors for the NX lineup in 2016, as is Ultra White for the F-Sport. The NX300h Hybrid isn't all that perky, but the turbocharged 2016 Lexus NX 200t is fun to drive in its Sport mode. There are two different powertrain options offered in the 2016 Lexus NX lineup. The NX 300h Hybrid model is a good choice for a lot of households who don't mind paying a little extra for what's seen as a greener choice—and one that performs nearly as well—yet Lexus expects more than 90 percent of all NX models to use the standard turbocharged NX 200t setup. The NX 200t has Lexus' direct-injected and turbocharged 4-cylinder engine. 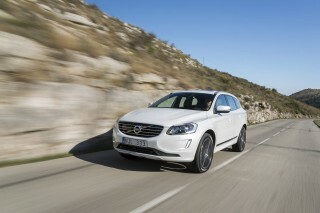 The turbocharged 2.0-liter inline-4 produces 235 horsepower and 258 pound-feet of torque. 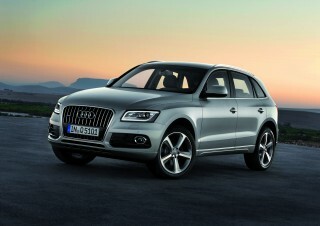 It's mated to a 6-speed automatic transmission, with front-wheel drive standard and all-wheel drive optional. Lexus notes that the engine has been tuned to vary between the conventional combustion cycle and the more efficient Atkinson cycle—which has previously been used only in hybrid powertrains—for greater fuel efficiency. Drivers won't notice any difference in engine note behind the wheel, but with luck, it should help cut the pain at the fuel pump. Unlike several of its competitors—the Audi Q5, BMW X3, and Mercedes GLC among them—the Lexus NX has no option for a six-cylinder engine, nor for a diesel. 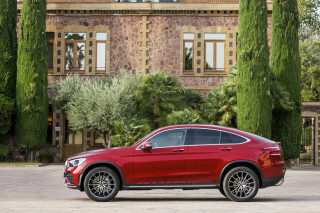 To both possibilities, that helps cut weight, and likely let the designers package the long, sloping nose, but it means this new luxury compact crossover has to be driven hard to obtain the best performance and response. The alternative powertrain used in the pricier NX 300h model is a 154-hp 2.5-liter inline-4 paired to the Toyota Hybrid Synergy Drive system, which combines two electric motor-generators that can power the vehicle alone—at low speeds, under light loads—recharge the battery, or supplement engine torque with electric power. Total output of the engine and electric motors combined is 194 hp. All-wheel drive is an optional on the hybrid NX too, but rather than the mechanical system used in the NX 200t to distribute engine torque to all four wheels, the NX 300h adds a 50-kw (67-hp) electric motor on the rear axle to provide torque to the rear wheels when the drive control system senses power is needed. The NX offers good roadholding and handling, overall, with occupants sitting a bit lower than they do in the larger RX and less lean and body roll than you'd find in the Toyota RAV4 on which it's structurally based. For all the sporty visual cues, the NX 200t simply isn't a sporty-driving vehicle in its "Normal" driving mode. Because of a delay in power delivery—perhaps a mix of fuel-efficiency-minded engine controls and turbo lag—the driver is left to game the powertrain behavior they want by providing exaggerated inputs rather than smooth ones. Turning the knob to the "Sport" setting changes its personality. It holds higher revs longer and makes the acceleration significantly crisper, potentially at the price of lower real-world gas mileage. You can largely ignore the "Eco" setting unless you're on flat roads and surrounded by slow traffic, preferably in nice weather so the reduced climate control settings aren't noticeable. The F-Sport option is the one to have if you really enjoy the act of driving. The combination of its tuned suspension, more performance-oriented wheels and tires, and the "Sport" driving mode produces the one NX version that proved rewarding to throw around curving roads. We drove an F-Sport fitted with 18-inch alloy wheels and lower-profile summer tires, which delivered a noticeable improvement to roadholding. In addition to the Normal, Eco, and Sport modes, the NX hybrid has an electric-only mode that powers it only on electricity (at speeds below about 30 mph) as long as the battery holds out, which is generally less than a mile. Lexus has added what it calls a "kickdown switch" in the hybrid 300h to deliver immediate extra power when required; it works well enough, at the price of some increase in engine noise. Whether the NX hybrid will match those numbers in real-world use remains to be seen, as the larger RX has been the subject of some owner complaints for underachieving on its gas-mileage ratings. While Lexus has put a lot of work into giving the NX hybrid a more natural acceleration feel and minimizing the engine's tendency to spool immediately up to maximum speed and noise, it still doesn't really have enough electric power to accelerate in brisk traffic on the electric motor alone. So, like the larger RX, its engine usually switches itself on to provide power when accelerating. That said, the noise suppression is so good that drivers will have to watch the power meter to determine whether or not the car's stayed in electric mode—engine turn-on is all but imperceptible. If you're the new, younger buyer that Lexus hopes to attract to the NX—and you actually enjoy driving—the F-Sport model is the one to choose. 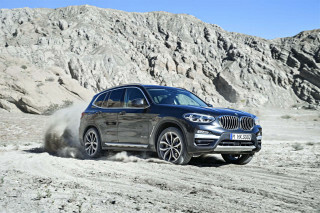 It can deliver spirited response and rewarding on-road handling, though it will require switching over to Sport mode. Quiet, flexible, spacious, and well-built, the 2016 Lexus NX pretty much delivers to every reasonable expectation. The 2016 Lexus NX is a compact crossover—only around 182 inches long, and a full size smaller than the larger RX when it comes to back-seat and cargo space. As long as you keep the comparisons to vehicles in its same size class, you'll find that it offers a very comfortable and relatively spacious interior. The front seating position isn't as high in the Lexus NX as in some other compact crossovers, giving it a more car-like feel and increasing head room. They're quite supportive, and the sport seats in the optional F-Sport package are even better, with substantial bolsters that feel like those in a sport sedan, rather than a crossover utility vehicle. The rear seats have decent leg room, though we found both cushions slightly flat compared to the bolstered front seats. The optional power folding rear seat also includes individually adjustable backrests, allowing each of two rear occupants to alter the seat angle to their liking. One surprising design aspect was that the roof pillar just behind the rear door angles forward enough that taller rear-seat passengers have to crane forward to see out the rear window. The long, low cargo area reflects a basic platform adapted from the high-volume Toyota RAV4, with that vehicle's practicality—though the sloping rear tailgate may prove challenging for large, rectangular boxes or other bulky items. That said, the cargo volume of 17.7 cubic feet with the rear seat up and 54.6 cubic feet with it folded down is among the lowest in the segment. Rather than a conventional vinyl cargo cover that rolls up to retract, the NX has a folding two-piece "tonneau board" to eliminate the gaps at either side. It looks dressier, but stowing it in the custom compartment under the load floor requires the cargo bay to be empty—which isn't always the case. The level of storage space inside the NX, from door pockets through a large glove box to an even larger storage box inside the center console armrest, is all very impressive. It has cargo trays and compartments, cupholders galore, and a sunglasses holder with a removable cover with a mirror inside—so you can check to make sure those expensive shades are positioned just right, presumably. The NX proved to be very quiet on most roads, and the hybrid model is particularly good at suppressing engine howl, the Achilles' heel of that powertrain. We'll leave you with a caution that the F-Sport setup and the more aggressive 18-inch wheel-and-tire combinations bring more road noise; the 17-inch base setup is noticeably quieter. The F-Sport package includes an active sound control that amplifies the engine note through the cabin when a roller switch on the lower center stack is engaged. Whether off or fully on, the sound is perfectly natural—and adding some engine noise makes the NX feel sportier if you're on nice curving mountain roads, even if it doesn't change the performance characteristics at all. The 2016 Lexus NX is one of the better-rated vehicles in its segment, according to safety ratings. The 2016 Lexus NX lineup has earned a very respectable set of safety ratings so far—including results from both major U.S. testing organizations. Besides that, the level of safety equipment here is excellent. The NX is fitted with eight airbags as standard: front and side bags for the two front-seat passengers, side-curtain airbags to cover the front and rear side windows, as well as a driver's knee airbag and a new front-seat passenger cushion airbag. The IIHS has awarded the NX with its Top Safety Pick+ designation after scoring "Good" ratings in all of its categories of occupant protection. The NHTSA has given the NX a five-star overall rating. That includes four stars in frontal impact and five for side impact. Like many new crossovers, the rear three-quarter vision isn't great in the Lexus NX. A rising window line meets a falling roofline to provide only a small triangular view out the rear side, and the rear-vision camera becomes a necessity for parking. A frontal-collision warning system is optional. It senses impending collisions with obstacles or other vehicles ahead via the sensors used for the adaptive cruise control. It's hardly one of the more subtle systems—although that's what you want here; it warns the driver with both a light and a buzzer if a crash is imminent, and will automatically brake if the driver doesn't respond. The system can bring the NX to a full stop from speeds up to 37 mph, and it earns the IIHS "Advanced" nod for front crash prevention. Lane-departure warning and automatic high beams are also available as additional safety functions. Both systems operate based off a windshield-mounted camera. The 2016 Lexus RX is every bit as well-equipped and luxurious as you might expect; prices aren't stratospheric with a few more options, either. There are three core models to the 2016 Lexus NX lineup: NX 200t, NX 200t F-Sport, and NX 300h hybrid. All three offer quite the potential to pack in more features through several packages as well as some a la carte options. The 2016 Lexus NX 200t comes standard with heated side mirrors, LED illumination for the door handles, keyless ignition, and 17-inch 10-spoke aluminum alloy wheels. Inside, the power adjustable driver's seat adjusts 10 ways, and the front passenger seat in eight. The 60/40-split rear seat reclines and folds down, and includes a center arm rest with cup holders. LED taillights, front running lights and LED low beams are included—although its high beams are halogen bulbs. Full LED high and low beams are optional. Footwell lighting is standard, and the dome and map lights are activated by touch switches in the headliner, though Lexus has wisely kept them off the console. The NX 200t F-Sport is distinguished by its black mesh grille, which is visually much bolder than the chrome slats on the standard NX. 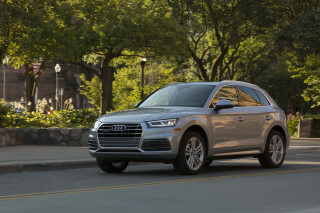 It also adds a number of other trim features, including metallic bumper moldings, black side mirrors, two choices of 18-inch wheels, distinctive cabin fittings, and well-bolstered sport seats with black or red upholstery and accent piping. The pedals and footrest are drilled aluminum—just like those on race cars in which every ounce of extraneous weight must be removed—a stylish, if superfluous, feature. The F-Sport also includes an engine sound composer, which lets the driver boost the engine note heard inside the cabin via a roller switch on the console. The NX 300h is the most expensive model in the lineup; it includes standard LED headlamps and adaptive LED fog lamps that also light up to illuminate the road around a corner when the turn signal is switched on. Aside from a few chrome badges on the doors and tailgate, the hybrid 300h is visually indistinguishable from the 200t. 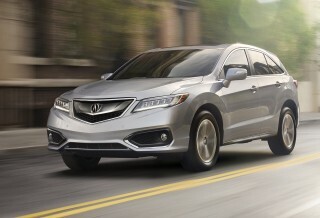 Three different trim levels will be offered: Base, Comfort, and Premium. All three use seat upholstery with smooth bolsters and perforated inserts, combined with Dark Umber trim; the Luxury package includes leather upholstery and mocha wood trim. The infotainment system is compatible with Siri Eyes Free Mode, used on Apple iPhone 4S and later models, and for 2016 is compatible with Lexus Enform Connect, a telematics service that displays vehicle maintenance alerts and others via an app. The previous joystick has been replaced with a Remote Touch Interface operated via a touchpad in the center console. Drivers can, theoretically, access functions by moving the cursor using only their finger, though we didn't find it notably less distracting than the previous method—and it still requires watching the cursor movement on the screen while driving. Front passengers can also operate the interface, which proved the best method. Available options include a power folding 60/40-split folding rear seat, which also reclines—a Lexus first—and a power liftgate. The standard audio system features HD radio, Bluetooth pairing, free traffic and weather data, and a caching feature that lets listeners temporarily pause and store a song or news broadcast for up to 15 minutes. The optional Premium Audio system combines digital signal processing for better high notes with an eight-channel amplifier, playing through eight speakers. A further option is a pair of additional speakers, one in the central dash and a subwoofer in the tailgate. A navigation system with the Lexus Enform information service is also optional, displayed on a 7.0-inch touchscreen also used for multimedia functions. Its predictive traffic information includes up-to-the-hour detours, ETA calculation, and fuel-station mapping when the low-fuel alert comes on. It also adds a second USB port. Lexus also offers Qi wireless charging—in a tray to recharge smartphones and other devices fitted with the appropriate hardware. It reduces the clutter of USB cables and 12-volt adapters. Fuel economy ratings for the 2016 Lexus NX lineup are good, but not quite exceptional. The 2016 Lexus NX lineup skips any sort of V-6 option—it goes turbocharged instead. For the most part, that results in a relatively fuel-efficient non-hybrid model. Go with the NX 300h Hybrid model, and you'll do much better yet, with well over 30 mpg in combined driving conditions. The front-drive NX 200t starts at 22 mpg city, 28 highway, 25 combined; all-wheel drive only sacrifices 1 mpg combined from that rating. The NX 200t in F Sport guise dips further: 22/27/24 mpg, according to the EPA. That's about average for a luxury compact crossover in this class. The hybrid NX 300h gets better ratings, at 35/31/33 mpg for front drive; 33/30/32 mpg for all-wheel drive. 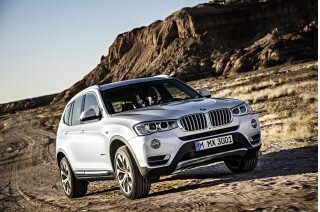 Those numbers are better than a diesel in the segment, with 30 mpg combined delivered by the diesel BMW X3 xDrive28d. In all of these cases, real-world mileage is the true gauge. However, from our experience the larger RX hybrid is an underachiever in real-world driving—unless you can use a lot of restraint and drive mostly around town, gently—while those German diesel models tend to far outdo their highway numbers on the open road. Looking for a different year of the Lexus NX?